Fish for dinner? Fish for lunch? Hell yes. And fish for breakfast? Maybe not. But my point is, I can practically live on fish and I like my fish in any form and shape but no raw fish for me please. Although, I love boiled fish a lot. Now, this doesn’t sound very exciting unless you haven’t tried my special boiled fish recipe. 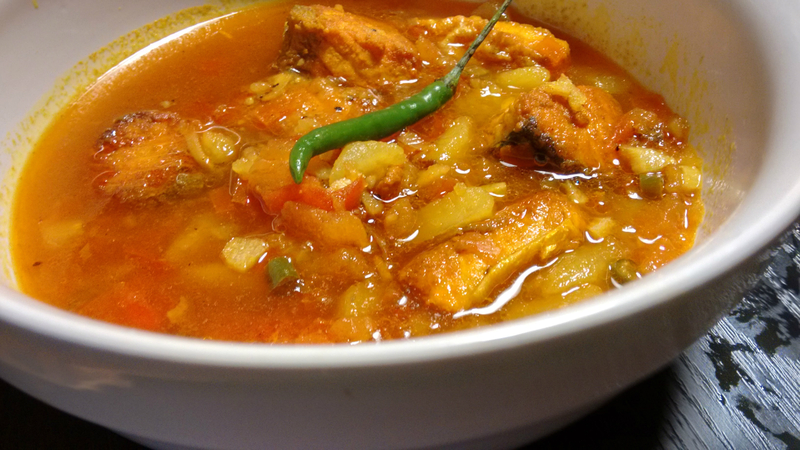 To make my love for food extra special I keep trying new recipes now and then and this boiled fish recipes was the outcome of one of those severe hunger bouts back in my college days. My roommates and friends loved this recipe so much that I had to cook it again and again. I forgot all about it when college was over and we had to go out to earn a living. Cooking some rice and a lousy curry seemed like the toughest job after a hard day at work. Now that I am on a sabbatical and have all the time in the world, I decided to recreate this in my Finnish kitchen. The most favourite rohu fish was hard to find. So I settled for salmon. Salmon is a very tender fish and has a sweet taste and I was kind of scared to boil it as I wasn’t sure about combining it with Indian spices. I went ahead anyway and the outcome was pretty good. It is a very simple dish and all you need to do is stir the stew continuously. The rest is an easy glide. If you are tempted to try this at home just go ahead and make your tummy happy. Disclaimer- Boiled food doesn’t mean it has to be bland. This one is a medium spicy dish and you can increase and decrease the amount of spices used. Take 8 pieces of fresh salmon, shallow fry them in a flat pan. You can skip this step for a healthier version and just add the pieces into the broth. But I like to keep aside the oil used to fry the fish and later mix it into the broth. This gives a fishy flavour of course. Plus, the fish doesn’t break easily. Add salt and sugar to taste. Then create a mixture of coriander powder, cumin powder and ground pepper. Add the mixture into the already boiling broth. The tomato gives the broth a nice colour and it doesn’t look bland anymore. Having achieved the perfect colour you can now proceed to the final part. Add some finely chopped bamboo shoots. If you don’t have bamboo shoots you can add lemon juice for the tangy flavour. But I would recommend bamboo shoot as this gives the whole thing a different flavour. You can add lemon grass as well. Now, add the fried fish pieces into the stew along with oil used in frying the fish and cover the pot with a lid. Cook this for 8-10 minutes and not more than that as we don’t want the fish to break. You can add a few drops of mustard oil if you are not frying the fish. Turn off the gas and add a few drops of soy sauce (optional). Garnish with coriander. I didn’t have coriander. So I settled for a chilli. Don’t forget to click a picture and share it with me.